On one of my seemingly increasingly frequent work trips to London, due to wrapping thing up early in my last meeting of the day, I had a bit of time to kill before my train back home to Cardiff. Having not had lunch I decided to give a place I had wanted to try for a while a go, in the form of Flat Iron (a joint with a no reservations policy and legendary queues at peak times, but apparently more accessible in the afternoon – post the lunchtime rush). 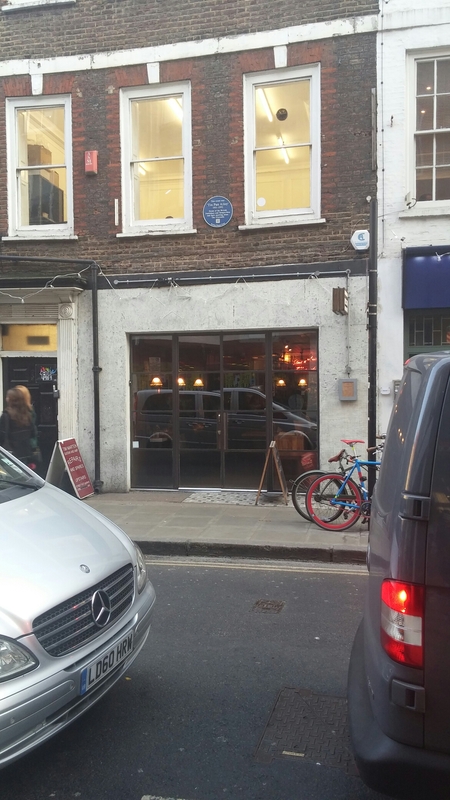 With three sites in London I settled on the Denmark Street one, being on the route tube wise from my firm’s offices in the City to Paddington. This place really doesn’t believe in advertising its presence. Perhaps at peak times the queue does that for it, but with no such queue at the time of my visit I walk passed it twice before I realised it was there and then that it was actually open. 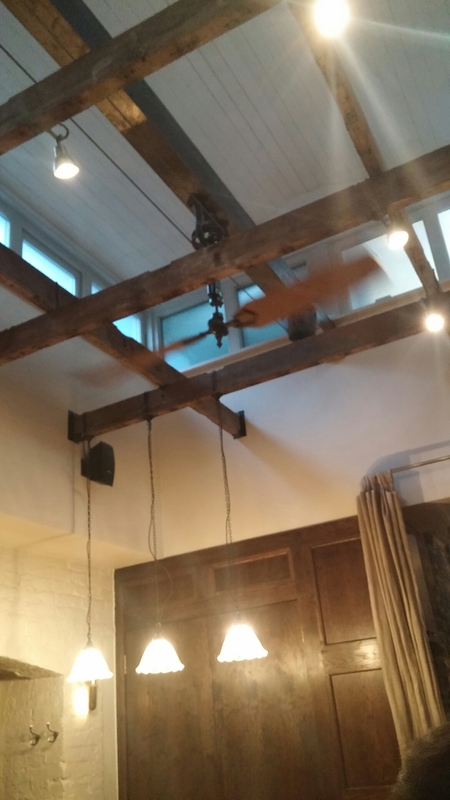 with a few quirky features like propeller fans on the ceilings. On the table you are presented with a somewhat fearsome (but ultimately entirely unnecessary and all a bit comical) cleaver as part of the cutlery. On being taken to my table, I was given one of those seemingly achingly trendy blue rimmed enamel cups (looked to me like cups they serve – according to my only valid, having not been, prison reference the classic Porridge – tea up in prisons) which was full of nicely salted popcorn and some iced water (the later in a different receptacle, of course). 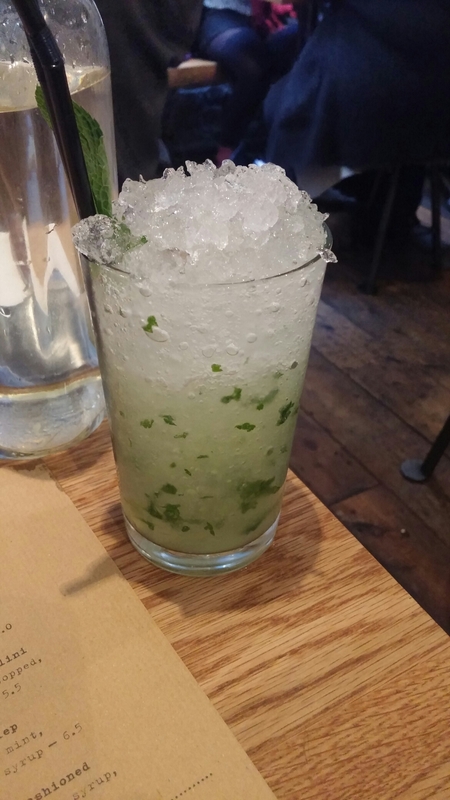 I munched and sipped on these whilst perusing the very brief menu. At this place, it is a steak or a burger and if you don’t fancy either of these then close the door on your way out. 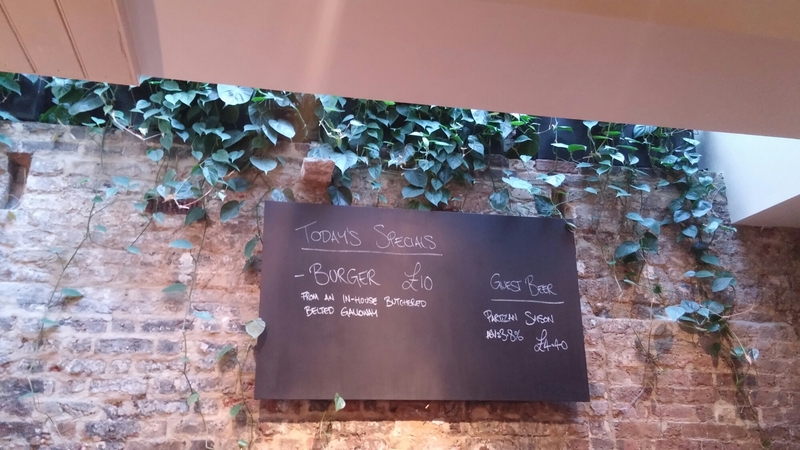 There are also specials, on my visit in the form of a burger (admirably cooked medium rare unless – you, in my view , foolishly – stipulated otherwise). These are apparently deep fried – a new one on me. It is said to seal in the juices. 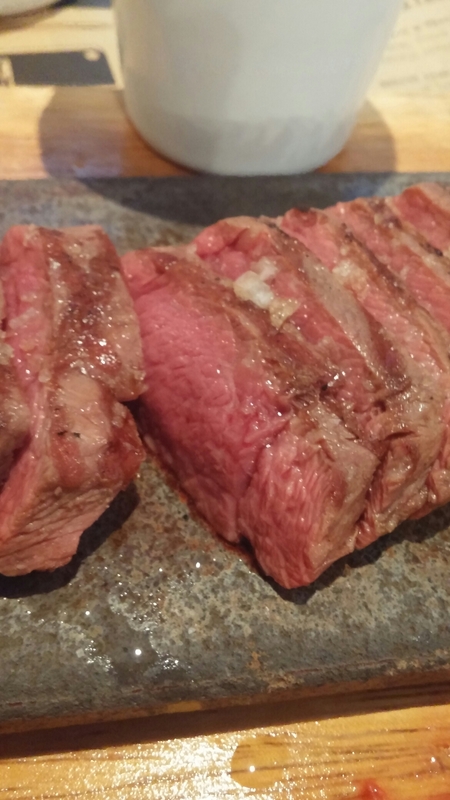 I love a good steak (although I must say I am more a fan of fattier cuts – where there is fat there is flavour – than the leaner ones such as the flat iron/butler’s steak on offer here), so it was always going to be the steak for me. I decided against a sauce with my steak, although tempted by the choice and the pleasing £1 price tag (I hate it when places overcharge for a miniscule pot of sauce), as I wanted to taste the meat naked (the meat, not me). I was asked by the waiter how I would like it cooked and, whilst I usually go for my steak blue, decided to have it medium rare as per the waiter’s recommendation (I would not recommend going medium well or over for this cut as it will become tough as old boots and you may as well eat your shoe). It was extremely tender (no need for that cleaver) and nicely seasoned with chunky crystals of sea salt scattered liberally on the surface. On the flavour front, it had a slight gameyness which I suspect fans of fillet (oh so boring) may not be 100% sold on. I like a bit of gameyness, so it was right up my street. If I had a criticism it would be I would have liked it to have been rested a bit longer before it was sliced to reintegrated those juices. As part of the £10 price tag you get a pot (not sure why it was a pot – side plate too big I suspect for the dinky tables) of salad. This was made up of lambs leaf lettuce, with a decent French dressing. Nice enough with the steak, especially as it was included in the £10 price tag. They also have a mix of interesting sides ( all reasonably priced – ranging from £2.50 to £3.50). I went for dripping cooked fries (I am a sucker for beef dripping, as my Grandmother use to give it to me on toast) and what I got was a decent portion of crisp French fries (£2.50) from which I could actually discern that lovely dripping flavour. They were properly seasoned too and perfect with the little pot of mayonnaise bought to the table, on my request, by the waiter. I enjoyed these chips alot. 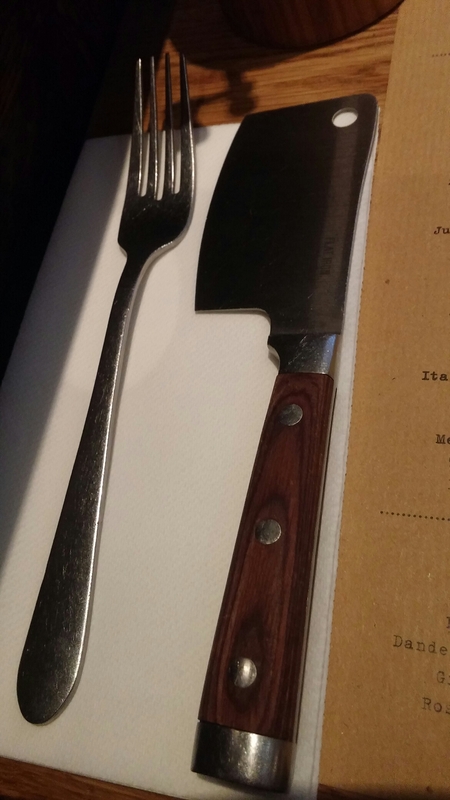 For the price you assume it is must be from some non descript factory cow, but the menu blurb indicates a dedicated herd of tradional & rare breed cows based in Yorkshire and in-house butchery. This makes the price even more surprising. I thought it a decent enough steak. Certainly a way off the best I have had (those were all a lot more price wise mind), but it was tasty enough and a bargain for the price (especially in Central London). l was not particularly enamoured with the stone and wood contraption the steak came on. 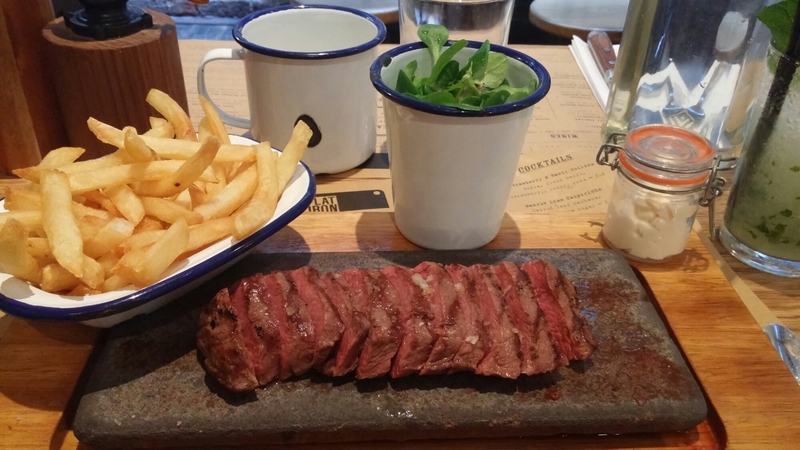 Still maintain a steak (and most meals for that matter) should be served on a proper plate. 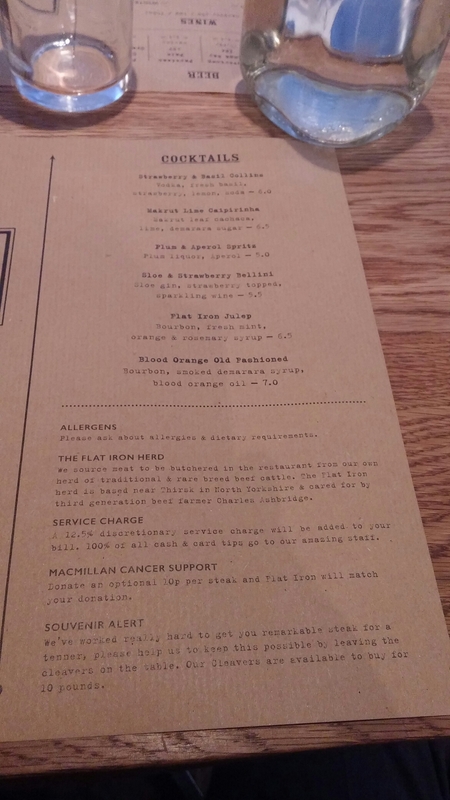 They have a short drinks list, which majors on the booze front on cocktails (ranging from £5.50 to £7). I thought the Flat Iron Julep sounded mighty fine (said in my best Suthern drawl). On the wine front they have a small, but reasonable selection of reds (including, an always nice to see, French Malbec – the stuff coming from Cahors in France originally, before it found true fame in Argentina). There are some whites, but none I would pair with a rare steak or burger. Bearing in mind the menu I wouldn’t have bothered with any whites myself bar from perhaps a Grüner Veltliner (a very versatile white wine food wise). Value wise, the wine prices are difficult to judge as no producer details or vintages are given. 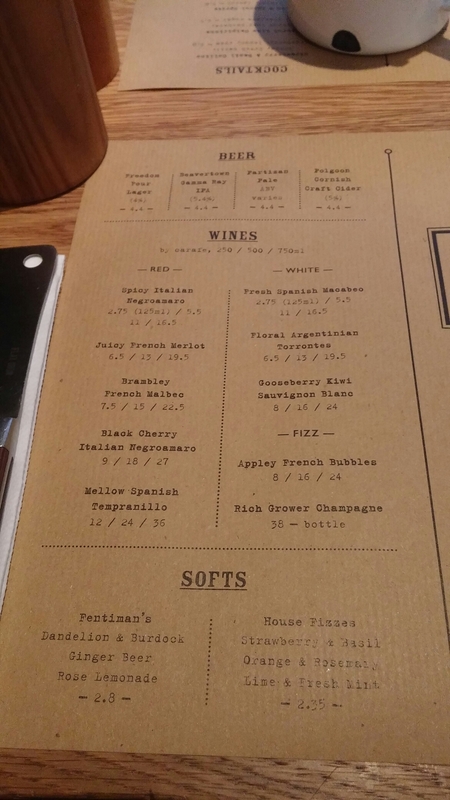 £36 for an unnamed tempranillo (it is a crianza or a reserva etc?) does seem a touch on the steep side though. I do like the fact that they do all wines in 250ml and 500ml carafe sizes, as well as by the bottle, and that they apply no mark up for the smaller sizes as against the bottle price. Please note this other places – you should be doing this!! There is also a small, but well formed, selection of craft beers (priced at £4.40). As is usually the case with me of a lunchtime, booze was not an option so I was on the soft drinks. Thankfully this place passes on the usual boring soda options and instead goes for Fentimans (£2.70) and a short selection of fruit and herb concoctions (strawberry and basil, orange and rosemary and lime and mint – all classic pairings and nicely priced at £2.35). 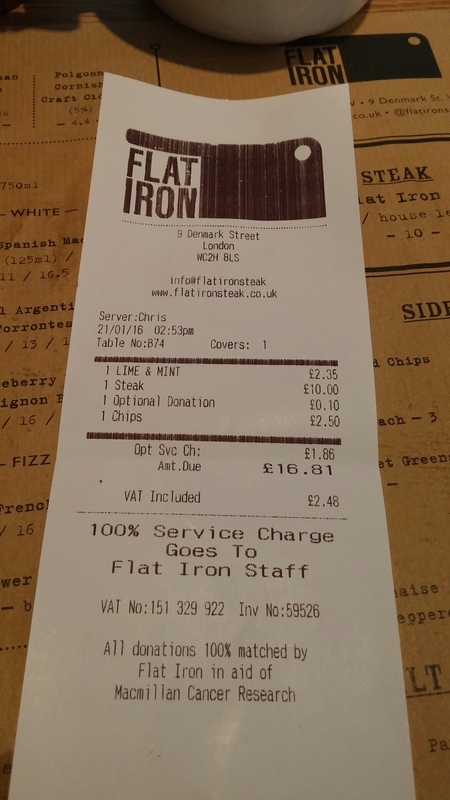 I enjoyed my meal at Flat Iron, with it made all the sweeter by the bargain price. 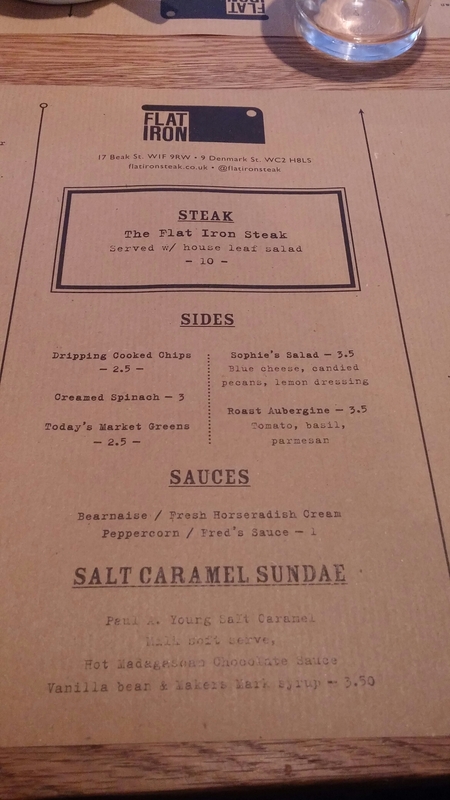 I got a decent plate of steak and chips, with a side salad and a drink (plus popcorn) for the paultry sum of £14.85. Add to this a service charge (added automatically which I don’t like, but it goes 100% to the staff which I do like – service was excellent) and a voluntary 10p charity donation to Macmillian Cancer Support (matched by Flat Iron) and my bill (with the added virtuousness of the donation) for a table service, sit down, steak and chips lunch came to £16.81. Can’t really fault that can you. Would I go back? Definitely – place is a bit of a bargain if you ask me. Not very informative am afraid. 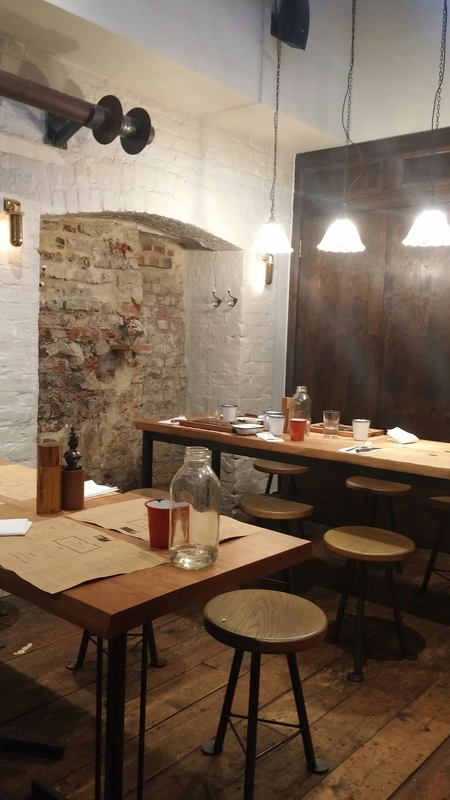 If you are visiting it is worth checking out their Twitter feed for any “specials” – for example on 6th Feb. at Denmark St. the specials were burgers from a beer fed Dexter for £10 and a Wagyu bavette from New Zealand for £18. Both sound rather good. 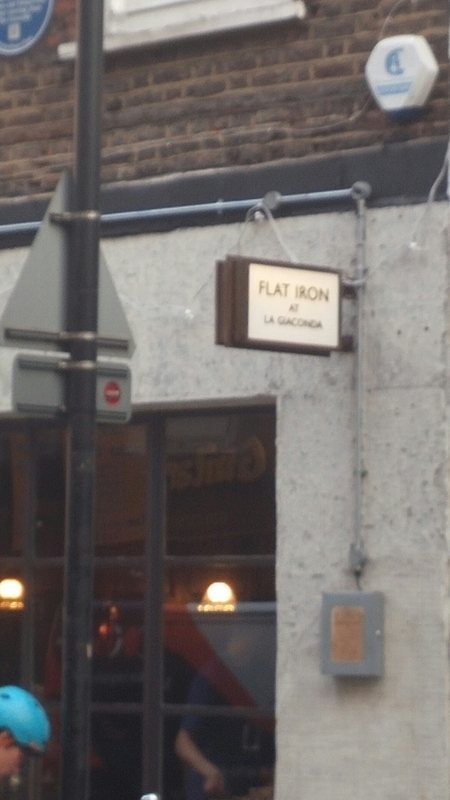 This entry was posted on Feb 7, 2016 by solicitingflavours in American food, Beer, bitter, Burger, burgers, craft beer, Drink, Flat Iron, Food, Food and wine products, French wine, london, lunch, lunchtime, Non alcoholic drink, Real ale, Red Wine, Restaurant Review, review, Rioja, Spanish wine, steak, Steak house, Tempranillo, White wine, wine.